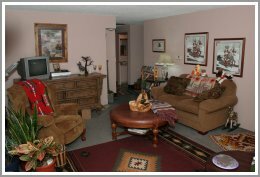 Fagan's Haven Bed and Breakfast, Boring Oregon, Near Skiing, quilt Shops, Hiking. As recommended by "What Travel Writers Say"
As featured in the Gresham Outlook "Checking in to check out"
Welcome to Fagan's Haven Bed & Breakfast , near Boring, Oregon, nestled between Portland, Oregon and Mount Hood, (off Highway 212 between Boring and Damascus ) with easy access from all major thoroughfares. Located just 30 minutes southeast of downtown Portland, Oregon, and 15 minutes from Gresham, Oregon, Fagan's Haven has been described at the best kept B&B secret in Oregon. No hiking paths or exotic buildings. Just a wonderful place to indulge your creative passion, spend time with friends, work on that secret Christmas present, or find a temporary respite. While staying at Fagan's Haven B&B you are near hiking, fishing, golfing, fabulous snow-covered Mt Hood, and some of the greatest quilt stores on the West Coast. Whether in the Sewing and Crafts Studio, the B&B, or outside, on clear days you can enjoy a view of Mt. Hood while working on your favorite craft or sewing project. My three-bedroom home is decorated with a slight western flare, with handmade quilts on every bed. Breakfast is served when you want it to be. A continental breakfast is provided during the week. On weekends my home-cooked breakfasts do my farmer heritage proud. I will do my best to accommodate all your special requests, favorite foods, and dietary needs. You are invited to the front room to read, watch television or videos, or snooze in one of my recliners. But be forewarned that on clear days you may be distracted by the view of Mt. Hood that flanks the rural farmland behind me. During your stay at the Haven you can enjoy my favorite room - - the 24\92 X 48\92 sewing, craft, and quilt studio. 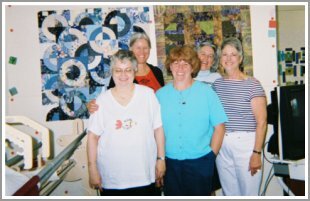 The studio is stocked with adjustable cutting tables, irons, 2 design walls, TV/VCR, superior lighting, adjustable padded chairs, an extensive library of craft and quilt books, and a notions wall with cutting mats, rulers, and other quilt and craft toys. 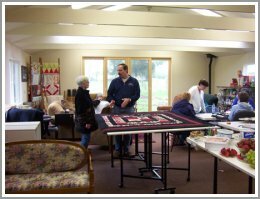 The studio offers plenty of space to lay out large quilts and craft projects. We all know that great motivation and ideas do not necessarily occur during the day, so you have 24-hour access to the studio. The studio is detached from the main house, so you can work through the wee hours and not worry about disturbing others with your late- night creativity. For those who cannot spend the night, but would love to be able to spread out to work on a favorite quilt, Christmas surprise, wedding gown, or celebrate a new baby with a shower, the sewing studio is also available for $10 per person per day ($50 minimum) by appointment. The studio is ideal for book clubs, scrap bookers, club meetings, seminars, and classes. Consider the possibility of a light brunch prepared for your group. Contact me for special rates. The multi-use carpeted studio is fitted with 4\92 and 6\92 tables, adjustable height cutting tables (you can lay out your king-size quilt for basting and not use the floor), two 8\92 design walls, superior lighting, padded chairs, ironing centers, TV/VCR, cozy pellet stove, skylights, microwave, fridge, folding chairs, and a restroom. Use my most popular open horseshoe arrangement or set up the studio in a configuration that is most productive for your particular group. The view of Mt Hood is icing on the cake! Coming to Play Day or Graduation at the Oregon Guide Dog School? We love Guide Dogs from puppy to graduates, and their people are welcome to come as well. The Oregon Guide Dog School is just minutes away. The Haven is a convenient overnight location to start and end your tour of Mt. Hood. It is a half hour drive to/from the Portland airport, and a great breakfast will start your day before a tour of Mt Hood and other area attractions. If your forte is photography, stay at the Haven for a central location to many of Oregon\92s natural attractions. A good night's sleep and a great breakfast will start your days of photographing Mt Hood, Multnomah Falls, the Columbia River Gorge, and other local sites. Contractors. Are you bringing your crew to the East Portland area for your new construction project? Treat them well, and book their stay at the Haven instead of a local hotel. Yours will be the best rested, best fed men on the jobsite. Just need a place to recoup from tax season, wedding planning, or in-laws? Come hide at the Haven. Read a book, watch the ducks, find a local hiking path, sleep in, have breakfast really really late. Children are welcome with prior approval. "Quilts touch our deepest longing for ourselves and our children, open direct channels to our emotions, hopes, and dreams as only great art can." "They are the most intimate of objects, created out of love and care, metaphorically wrapping the sleeper in the warmth and concern of the maker's affection, promising comfort, protection, and peace through the night's dark uncertainties."